Available in early November, the no frills Phoenix electric salamander is equipped with fast heat up ‘Hi-Light’ elements, which are ready to cook in just eight seconds. It has three heat zones, enabling the operator to only switch on the area required, to conserve energy. Traditionally operators keep salamanders on standby, as they can take time to reach temperature. However, with the Hi-Light elements and a 15-minute timer, the new Phoenix salamander’s grill is only turned on when it is needed saving energy. 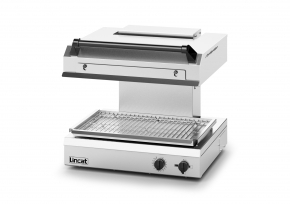 In addition, the height adjustable grill hood reduces the amount of heat which is lost to the surrounding area. The 600mm wide Phoenix electric salamander is GN 1/1 compatible. It has a removable grilling rack and fat collection tray. There is easy access to all parts from the front and top of the unit, making it simple to clean and service. Constructed from stainless steel, the unit is suitable for both wall and bench mounting, and is supplied on height-adjustable 25-45mm legs. Also on display at the Restaurant Show will be the Phoenix induction oven range, as well as the free-standing FriFri 622 Vision fryer. Visitors to the show will be able to see the 622 Vision’s twin tanks in action as it pumps water (demonstrating the oil filtration process) through the fryer, as well as the basket lift function. “The Phoenix electric salamander’s fast heat-up Hi-Light elements are ready to cook food in just eight seconds, and the three heat zones can be switched on as and when required, to conserve energy. Operators would have traditionally paid more for energy efficient equipment such as this, but our no frills Phoenix range provides cutting edge technology at an affordable price.